When looking for an airbrush makeup kit, there are a few subtle differences between the components. These can make a big impact on your daily use of the product. The kits require a substantial amount of money. So it's best to invest in it only when you're sure that you want to make that long term commitment. A compressor unit is the main airbrush tool that compresses the air that will be used in the process. It can have either a certain number of pressure settings, or a continous setting where you can get the pressure you want using a lever. The number of settings is one of the factors that go with price. A less expensive kit(of the same brand) might have a finite number of settings for pressure. The pressure regulates the air flow through the airbrush. A continuous setting is more convenient , especially for a beginner. You can then easily adjust the pressure so that you find just the right setting for the amount of coverage you want. The airbrush stylus is the tool with which the makeup will be dispersed. This is the airbrush itself, through which the makeup-air-mix flows onto your skin. Airbrushes can be single or dual action. A single action airbrush means that pushing down on the trigger releases both air and colour. So the amount of makeup you'd have can only be controlled by a separate dial. This would mean that you'll have to control the amount of makeup that goes onto your skin by putting the stylus further from, or closer to your face. 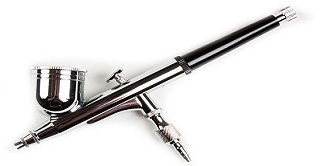 A dual action airbrush is the one most commonly used in airbrush kits. Also the most appropriate for makeup application. The first action is pushing down on the trigger. This releases air, whose amount is controlled by your compressor setting. Then, pulling back on the trigger controls the amount of colour that goes onto your face. The stylus is easy to clean out with cleaner inbetween makeup changes. The stylus usually has a gravity feed cup mounted on it. The makeup goes in there to get mixed in with the oxygen. This cup enables you to easily swap between all types of makeup. From foundation, to blush, bronzer, and different eye makeup colours. That's a wrap of the technical contents of an airbrush makeup kit. So when comparing kits and their prices, you have to decide whether the price difference is worth the convenience you will lose or gain. Prices range from the equivalent of about $200, and go up according to the components included in the kit. 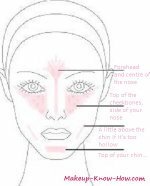 The makeup that may or may not be included in the kit includes concealer, correctors, foundation, blush, eyeliner, eyeshadow, bronzer, and luminizer. The wide array of makeup available for airbrushing makes it a worthwhile investment. This is especialy true if you'll be applying makeup everyday. A downside though, is that you can't use regular makeup in an airbrushing machine because the formulation is usually too thick. Airbrush makeup has a higher concentration of pigment. Don't forget that the best way to keep your airbrush in tip-top shape is to clean it after each use. This you can do by running cleaning solution through it. When make up dries up in the nozzle or the needle tip, this can affect the airbrush's performance. Clean it out after every use following the guidelines from the manufacturer. Kits often come with a cleaner, and there are also cleaning kits available. On a weekly basis( if you use it everyday), you might want to give the airbrush a more thorough clean by disassembling according to the instructions, and cleaning out all traces of product. For a list of a few online suppliers of an airbrush makeup kit and products, check out our airbrush makeup page.